The name of the holiday “Passover,” is an allusion to God’s passing over the Israelite households during the plague of the firstborn, a critical element in the events of the Exodus. 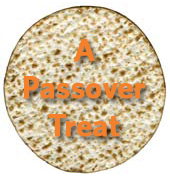 The name "Passover," however, may be derived from an English convolution of the Hebrew word Pesach, the Torah’s term for the Paschal lamb sacrificed on the holiday. The Torah refers to Chag Ha’pesach, the Holiday of the Paschal Lamb, only as the actual seder feast. In almost all other cases,* the Torah refers to this springtime holiday as Chag Ha’matzot, the Holiday of the Unleavened Bread: "The feast of unleavened bread shall you keep. Seven days you shall eat unleavened bread" (Exodus 34:18). Special Matzot Many Jews will only eat shmura matzah (especially during the Seder). Literally "guarded matzah," shmura matzah has been carefully supervised from the time the wheat was harvested until it was baked so that it remained perfectly dry until being deliberately mixed with water (lest it become chametz). This practice is based on the verse in Exodus 12:17, "And you shall guard the matzot..."
Egg matzah is "enriched matzah." Since it is more extravagant, it fails to fulfill the requirement of "lechem oh’nee," bread of affliction (poverty). According to Ashkenazi custom, egg matzah may only be eaten on Passover by someone who is physically infirm, very young or very old, and has difficulty digesting regular matzah. This Treat was last posted on April 7, 2015.